A 621-foot bulk carrier remains hard aground in the St. Lawrence River Tuesday with salvors on scene and preparing to refloat the ship. The Bahamian-flagged MV Juno, carrying a load of sugar, ran aground early Monday morning in the vicinity of Wellesley Island in the St. Lawrence River, New York, while transiting inbound from the St. Lawrence Seaway to the Port of Toronto. The vessel is slightly listing to port after taking on water in one of the forward ballast tanks. There are no reported injuries to the crew, and no reported pollution. Vessel navigation is currently suspended in the vicinity of the grounding, with seven other vessels in the area waiting for the channel to re-open. Salvage personnel arrived on scene late Monday evening and hired tugs arrived late Tuesday morning to assist in refloating the vessel, according to the Coast Guard. A unified command, consisting of the U.S. Coast Guard, the Canadian Coast Guard, the Saint Lawrence Seaway Development Corporation, Saint Lawrence Seaway Management Corporation, the ship owner Polsteam USA, Seaway Traffic, the New York State Department of Environmental Conservation and Jefferson County, has been set up to manage the incident. The vessel reportedly ran aground after a loss of steering. The vessel owners reported Tuesday morning that the steering malfunction has been fixed. 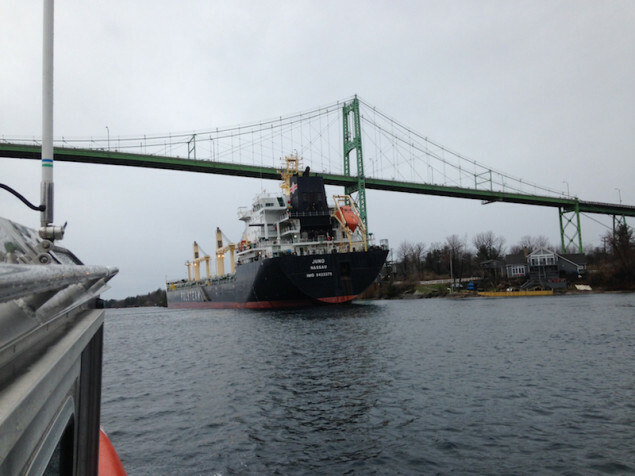 The vessel never made contact with the bridge, the Coast Guard said. This entry was posted in ship models, wood boat models, wood ship models and tagged bulk carrier, models of ships, ship models for sale. Bookmark the permalink.